Sutton was paralyzed from the waist down in a rodeo accident at the age of 23. "I’ve often gotten asked if I could go back and change that day, would I do it? And the answer is no," Sutton said. "The answer is no because of what I know now," Sutton says of his wife Kelsea, his two-year-old son Liam, and the community that he says stepped up to get him through the challenging rehab that followed his injury. Sutton went through rehabilitation in Denver, Colorado, then moved back to his home state of South Dakota, started a job at a local bank, and entered politics in 2010, running for and winning a state Senate seat in the southwestern part of the state. But Sutton, who says he is pro-life, pro-gun,"Prairie Populist," touts his bipartisan credentials in the state legislature, and says he believes there is a hunger from South Dakota voters for a unifying figure, not a stringent ideologue. "I’m sure there are some views that I hold that Republicans might not like. There are some views I hold that Democrats might not like. But at the end of the day the important thing to remember is we have more in common than not, regardless of party affiliation," Sutton told ABC News ahead of Tuesday's primaries in South Dakota, where he is running unopposed for the Democratic nomination. That faith in finding common ground will be put to the test in November, when Sutton will face one of two Republicans who have already been elected multiple times statewide, Rep. Kristi Noem or the state's Attorney General Marty Jackley, who have been fiercely fighting for the GOP nomination for months. (J. Scott Applewhite/AP, FILE) South Dakota gubernatorial candidate and Rep. Kristi Noem speaks on Capitol Hill in Washington, D.C., Dec. 5, 2017. "I think there’s a lot of people out there that struggle in a number of ways," Sutton said, "Whether that’s with the type of injury I had or something completely different that’s just as hard. Maybe it’s challenges with their loved ones or their spouse, or mental health challenges." Sutton refers to his journey as a "South Dakota story of perseverance." "When you get knocked down, you get up again and you keep fighting. You never give up and you never quit." "It scares me to think about today if I didn’t have that education," Sutton, who went back to get his degree at the of the University of Wyoming following his recovery, said, "I think that sets me apart and gives me a renewed focus on the importance of education because of what it did for me, and the opportunities that it gave me,"
"It is a very conservative state," said David Wiltse, an assistant professor of history at South Dakota State University, citing the GOP's hold on all statewide elected offices in the state. In the early 2000's, both of the state's U.S. Senate seat and its lone U.S. House seat were all held by Democrats, including former Senate Majority Leader Tom Daschle. It is in that Democratic history that Sutton sees an opportunity to recapture the governor's mansion for the first time in over four decades. Barb Johnson, the wife of former South Dakota Democratic Senator Tim Johnson, chairs Sutton's campaign, and Sutton cites Johnson, Daschle and former Democratic Rep. Stephanie Herseth Sandlin as evidence that it is possible for the party to win statewide. "The right Democrat can win, you just have to be a South Dakotan first and that’s what I am," Sutton said. But it has been more than a few years since Democrats have tasted statewide victory in the Mount Rushmore state, and Sutton's challenge is stark. "If you think back to people like Tim Johnson, Tom Daschle who won statewide election – they won statewide election back in the 90’s," said Wiltse, "That’s when they first became incumbents, and then they had all those advantages of incumbency working for a decade or so before they finally either quit in the case of Johnson or were elected out of office in the case of Daschle." "The big question, of course, is whether [Sutton's] appeal can overcome people’s partisan identification," Wiltse added, "And he knows that he’s running uphill when it comes to the fundamentals in the state." When it comes to his ideology, Sutton is quick to describe himself as a moderate, saying "I don't think any party has a monopoly on good ideas." "Certainly in the end in the fall the smart money would be on just about any Republican that gets the nomination," Wiltse added. Noem has held the state's lone U.S. House seat since 2011, and before that was in the state legislature. Jackley was appointed as the state's Attorney General in 2009 following a stint as U.S. Attorney, winning re-election as South Dakota's top cop in 2010 and 2014. 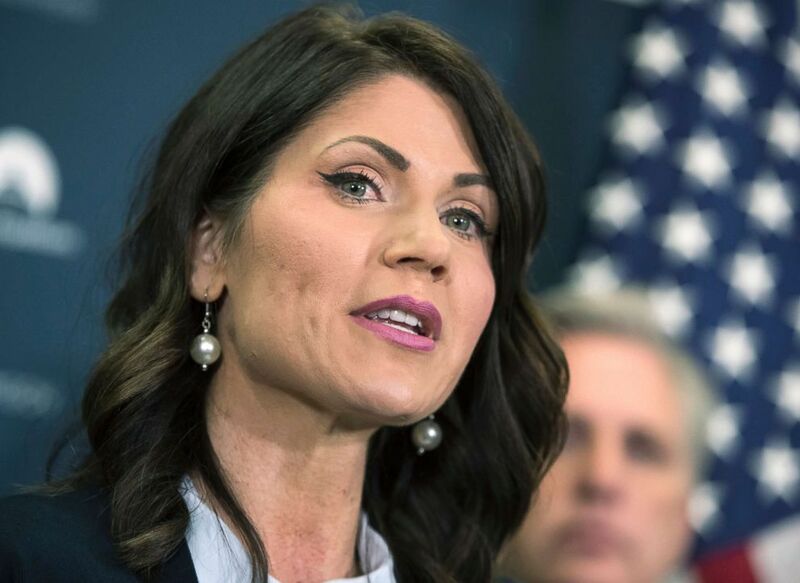 The candidates have exchanged sharp words in the waning days of the campaign, with Jackley painting Noem as part of the "Washington Machine," while Noem has called Jackley a "status quo" politician, attacks that have kept the race tight heading into its final days. "Kristi Noem has trumpeted a few things, mostly the tax cuts that came through four or five months ago," Wiltse said, "It’s not been a real who can be more Trumpier than Trump, but they are making a clear association with the president." Sutton is much less committal when it comes to Trump, saying he recognizes that Trump has a lot of support in South Dakota, and will try to work with the federal government "when it makes sense" for the state. After Sutton's opponent is finalized Tuesday, the real test begins of whether or not a Democrat can take his populist rhetoric to all corners of the state. "He’s got that compelling backstory, but now the question is does he know the state well enough to really effectively campaign everywhere," Wiltse said, "That’s the big problem for Democrats in this state is there are just little pockets of Democratic support. They just don’t have that same ability to campaign in all corners of the state that most Republicans have." Sutton believes the lessons he's learned, both from his injury and his political career, put him in a position to make the race competitive. "My story is unique but it’s not unique to South Dakota," Sutton said, "It taught me a lot about myself. It taught me that when we work together we can accomplish anything, and that’s going to be the driving force of this race."